Located in the West Portal area, Forest Hill is an affluent neighborhood with unique houses and beautiful landscape architecture. This area is great to walk around and admire the setting. It's close to Laguna Honda Reservoir where you can easily visit on a nice sunny day! 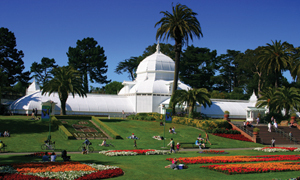 Forest Hill Park is owned by the San Francisco Recreation and Parks Department. Light Rail: lines K, L, M, T at Forest Hill Station. Despite heavily promoting the development's 'natural park' setting, Newell-Murdoch obviously felt Nature's wonders needed some help, as the surviving concrete urns, benches, stairways and banisters testify. Most of the forest's trees never had a chance to shade the new homes. While any lane in Forest Hill is far more arbored than your typical city street, early photos and newsreels of the 1912 landscaping work show a majority of the trees being cut down. As an additional irony the forest was not natural for the area at all. Adolph Sutro had planted every tree on the land in the 1880s. But one can't deny the beauty that survives. The curving, dipping, hill-circling streets feel like back-country roads littered with Grecian ruins. The homes pretend to be English hunting lodges, Dutch cottages, and French palaces with pillared marble porticos. Architect David Coleman designed the first completed home in Forest Hill at 266 Pacheco Street. Built for William Murdoch, Jr. himself, it doesn't look to have changed a bit in the past 89 years. Across the street the imposing home built for J.S. Malloch at 225 Pacheco has obviously undergone a few renovations. These first few residences reflect the idea Newell-Murdoch obviously had in mind: elegant, formal homes for well-off white families who could stroll out and see an elegant, formal landscape. When sales slowed, and the developers signed the management of Forest Hill over to the residents, imagination didn't die out. The Lang Realty Company filled in the empty lots and used gimmicks such as the 'Studio House of Stone' at 400 Castenda Avenue. The company claimed that the unusual house attracted thousands who were 'enthusiastic in their praise of the quaint, medieval atmosphere that pervades every room.' 5 The Stone House, built in 1927, looks just as medieval and stoney today. The year before, Lang Realty teamed up with the San Francisco Chronicle and a host of home furnishing companies to create the 'San Francisco Model Home' at 90 Lopez, supposedly for 'educational purposes in better homecraft.' The newspaper reported almost weekly on the building's progress, extolling everything from the roof tiles (courtesy of California Pottery Company), to the Corbin door locks (from Palace Hardware Company), to the Frigidaire Automatic Refrigerator, which 'unlike an ice box [...] has no drain pipe to clean, no drain pan to empty and no ice delivery to worry about.' 6 More thousands reportedly flocked to see this amazing structure which looks rather unamazing behind the trees today. What Forest Hill is best known for are three structures by Bernard Maybeck, the renowned architect of the Palace of Fine Arts. Fans of Maybeck still pull up in front of the Forest Hill Clubhouse, 270 Castenada Avenue (built for S. Erlanger in 1916), and 51 Sotelo Avenue (for Edwin C. Young in 1914). After dropping my daughter off at school one morning I ran into a couple gawking at the clubhouse. They had come all the way from Texas to do their Maybeck tour. One doesn't need to be an architecture expert to appreciate Maybeck's work. The Sotelo Avenue house has a corner balcony/pulpit outfitted with wild clover cut-outs. I try to conjure some fiery orator standing in it, preaching hopelessly to the empty street. Eclectic and original, Bernard Maybeck turns out to be the winner in this country of imagination.